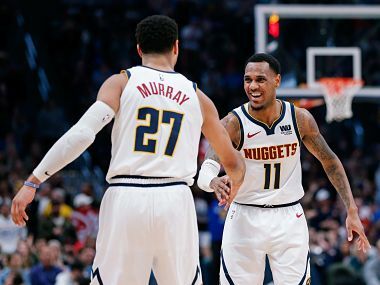 Los Angeles: Jamal Murray scored 15 points of his 19 points in the final quarter as the short-handed Denver Nuggets rallied to beat the Toronto Raptors 95-86 on Sunday in a battle between the league's East and West conference leaders. Nuggets improved to 20-9 on the season by going on a 23-2 run after falling behind 70-57 in the third quarter. 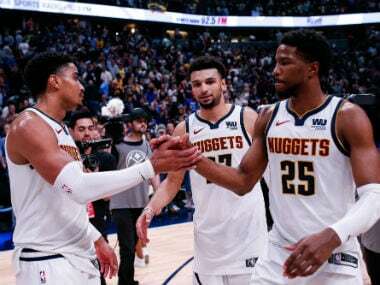 This marks the latest the Nuggets have been in first place in the West since December 1984. Kawhi Leonard had 29 points and 14 rebounds for the Eastern Conference-leading Raptors. Toronto won two of four games on their recent road trip and still have the NBA best record of 23-9. The Nuggets didn't have Will Barton (right hip surgery), Gary Harris (hip) and Paul Millsap (big toe) in the lineup. The Raptors were also missing several players including Kyle Lowry (thigh injury) and Jonas Valanciunas (thumb). Elsewhere, Ben Simmons delivered his third triple-double of the season and Jimmy Butler returned from an injury to score 19 points as the Philadelphia 76ers rolled over the Cleveland Cavaliers 128-105. Simmons finished with 22 points, 14 assists and 11 rebounds and Joel Embiid tallied 24 as the Sixers rallied from a second-quarter deficit to lead 65-58 at the half. Philadelphia had lost both games without Butler, who injured his groin in the first quarter Monday against Detroit. Philadelphia won that game, but then followed up by losing to Brooklyn and Indiana. "Having Jimmy back helped because we had multiple guys that could put it away," Simmons said. 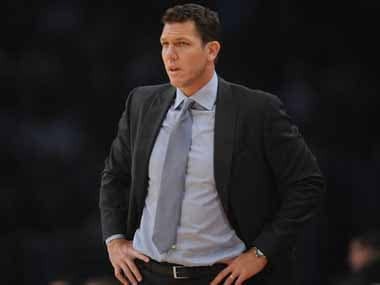 "I just do what I can offensively and help find guys who are scoring. Numbers are numbers. Obviously, stat-wise, it looks good." Landry Shamet added 16 points for Philadelphia, JJ Redick had 14 points and Wilson Chandler 11. Cleveland went on a 12-0 run in the third quarter to cut the Sixers lead to 86-85. 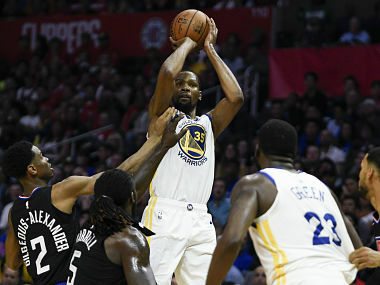 But that is as close as they would get as Wilson Chandler's three-pointer as time ran out in the third helped spark a game-deciding run that stretched into the fourth by Philadelphia. Also, John Wall was at his attacking best as the Washington Wizards easily rolled over the Los Angeles Lakers 128-110. 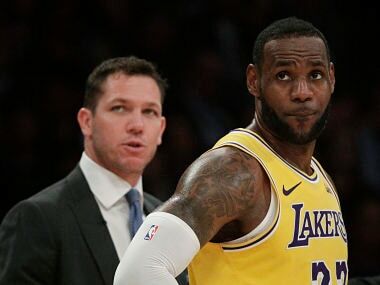 While Wall finished with 40 points and 14 assists, Lakers star LeBron James could only muster a season-low 13 points on dismal five-of-16 shooting. "We're a team that's built on energy and depth," four-time league MVP James said. "We didn't have either tonight." A day after he and Lonzo Ball each registered a triple-double in a win at Charlotte, James had six rebounds and three assists and sat out the fourth quarter. Recently acquired forward Sam Dekker scored a season-high 20 for Washington, including a buzzer-beating shot at the end of the third quarter that put the Wizards up 99-76.